Home > crochet > A WIP Week! So, in all the excitement of preparing my entry for the Deramores blog competition last week, all of my other works in progress (WIPs) had been carelessly cast aside whilst I frantically crocheted my cushion. Oh go on then, another look at my finished cushion – I still adore it! It should have come as no surprise to me then, that I was a bit lost when it was finished. As I’m sure a lot of other crafters will understand, I usually have several WIPs going at any one time – and dropping them all for a quick project is unusual. A sneaky progress shot of my Sophie’s Universe taken in the airport lounge! As this is a crochet-a-long project, I’ve been dipping in and out of working on it for a long while now. This picture was taken with sadness – it was the last time it was just about portable enough to crochet on the train. My stop-start with it wasn’t helped when I decided I wasn’t sure about one of the parts of the pattern a few weeks ago – a comparatively plain band around the edge with some butterfly motifs. This week, the final part was published and I can hold my hand up and say I was wrong, and I will be completing the blanket as designed. I don’t know why I thought I knew better, I bow down to Dedri‘s incredible design skills! As soon as I saw this pattern on Ravelry I knew I had to make it! I’m a big fan of stripes, and I don’t think my Tunisian crochet obsession will come as a shock to anyone… this pattern had it all. 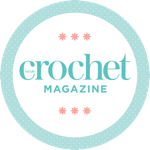 In fact, this patten alone encouraged me to subscribe to Simply Crochet magazine! I decided that although I’m a big fan of blue and white stripes, I have quite a lot of these colours in my wardrobe already. I also thought I’d like to work in cotton yarn as I wanted this to be a nice summer cover-up as well as a passable winter jumper. After filling and emptying my basket about 12 times, I eventually plumped for King Cole Cottonsoft DK in Jade, Ecru and Coral – with the gorgeous vibrant Coral being the colour for the shoulders. My colour choices – I’m really pleased! So far, I’m in love! And because it wouldn’t be an Elsie Pop project without a photo of at least one animal, I feel like I should tell you Teddy’s in love too. Teddy is also very helpful when working Tunisian simple stitch. Honest. Of course, two quite significant makes aren’t enough sometimes, so I also embarked upon another blanket this weekend. It’s one I can’t show any pictures of as it is a present for a friend, but I’m thrilled with the pattern so far. It’s one from this month’s Simply Crochet magazine, which showed up on my iPad this week, and it’s working up really quickly whilst still being really fun to work on – perfect for a blanket! I tend to always have a background project on the go – this is always something portable for the train, and usually something I’m working on without a pattern. At the moment I’m putting together a Tunisian crochet sampler wrap using the most beautiful Artesano yarn – their 4 ply Alpaca Silk. This is such gorgeous yarn to work with – so smooth and soft, it feels seriously indulgent to crochet with. It just glides over my bamboo hooks. I’m hoping I can get at least one of these big ticket WIPs completed by the end of this week so that I can get started on the long list of other projects I need to start. Just as well I like keeping busy! Until next time… which I hope will be at least one unveiling! I add most of my posts to link parties. Here is where you're likely to find this one! Dyeing my own yarn – a few firsts!